Koolatron 12-Volt Portable Stove Heats baby Bottles, Soups, Stews and Pizza Slices in Minutes. Cooks hotdogs, Hamburgers, Rice, Grilled Sandwiches and leftovers just like you popped it in the oven at home. Koolatron's 12-Volt Stove is not just a leftover warmer, it is a real 12-Volt Oven capable of cooking food to 300 degrees. My husband loved the lunchbox food warmer. It made a great Christmas gift. His friends wanted to know where he got it. I told them ROAD TRUCKER. A BIG THANK YOU! 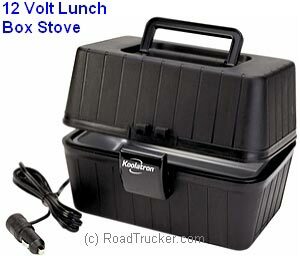 Koolatron 12-Volt Portable Stove Heats to a Blazing 300 degrees so your food is warmed or cooked in minutes. Cook in Your Vehicle in the space of a Lunch-box.